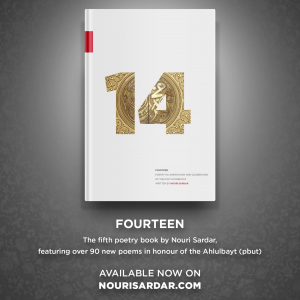 The fifth volume of collected poetry by Nouri Sardar, composed in honour of the fourteen infallibles that are the holy household of the Prophet Muhammad (pbuh) and his family (pbut). Written in celebration of their characters and in lamentation of their tragedies. An anthology of over 90 poems by Nouri Sardar written 2014-2016, largely unread, spanning across the history of the Fourteen Infallibles of the Ahlulbayt (pbuh). Includes the poem of 100 verses, an anthology of over 70 couplets, and an anthology of poetic narrations of the early battles in Islam.